A husband and wife entered into a separation agreement. 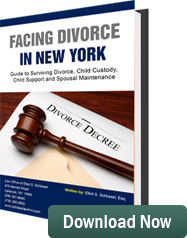 The separation agreement dealt with issues concerning custody, parenting time, and the parties’ finances. The agreement specifically provided during the period of time the parties were legally separated they would continue to deal with their finances as they had in the past while they were married. Pursuant to this portion of the agreement, both parties were to deposit their wages into a joint bank account at HSBC. The husband stopped depositing his earnings into the bank account. The wife brought a proceeding to enforce the parties’ separation agreement and cause the husband to continue depositing his income into the joint HSBC account. The husband took the position the separation agreement should be declared invalid and he should not be responsible for depositing his income into the HSBC joint account. Justice Jeffrey Goodstein sitting in the Supreme Court Part in Nassau County found the husband had breached the terms of the agreement and the wife had not. He granted the application from the wife to cause the husband to deposit all of his income for the years 2012 and 2013 into the joint bank account. In addition, he ordered both the husband and the wife to provide each other with a detailed accounting of the use of the funds which were deposited into the joint HSBC account. Judge Goodstein denied the husband’s application to set aside the separation agreement. Let’s start with the fact that if you are getting legally separated, you shouldn’t be sharing a joint bank account. You should each have separate bank accounts. This seems to be a very poorly drafted separation agreement. In the end, if you enter into a validly executed separation agreement, a court will most likely force you to live up to its terms. Husbands and fathers should be careful as to what they sign! Elliot S. Schlissel is a father’s rights lawyer. He has been representing fathers for more than 35 years.